Captain Marvel's origin story changes in 'Life of Captain Marvel', altering her forever – AiPT! Does this new origin align with the upcoming ‘Captain Marvel’ film? We think so! Talk about having war in your blood! That said, there is a panel that suggests Carol exhibited her powers as a baby. Also note the clever use of her first name. That alien way of saying the name is shed later in the issue for interesting reasons. 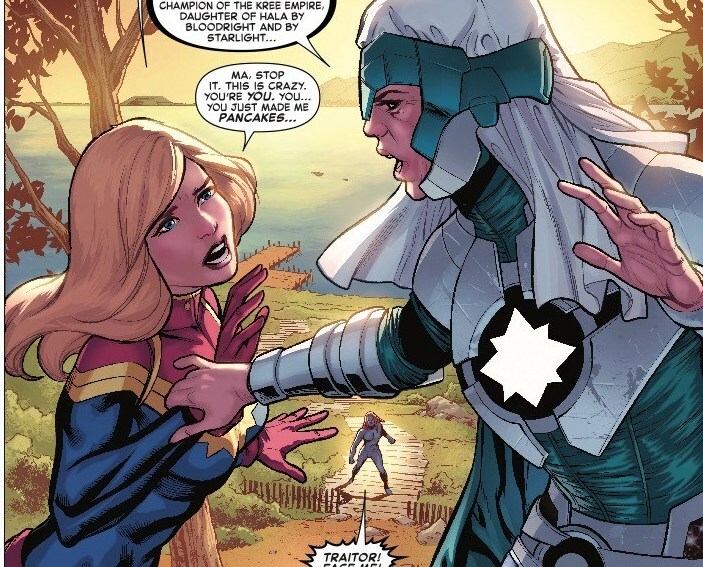 It’s later in the issue we get some interesting details as to why Carol’s Kree mother didn’t tell her earlier part of which is due to her father’s chauvinistic perspective. As revealed in the panels below Carol is not too pleased with this new information about dear old dad. Carol’s inability to know her true power is partly due to her father’s drunken choice to hide things from her to “protect” her which I think many people can relate to. There’s even more revealed in this issue, which I highly recommend picking up in comic shops, or digitally today.